Suggested Use: 1 capsule daily or as directed by a health care professional. GABA: if there ever was a “feel-good” amino acid, this is it. 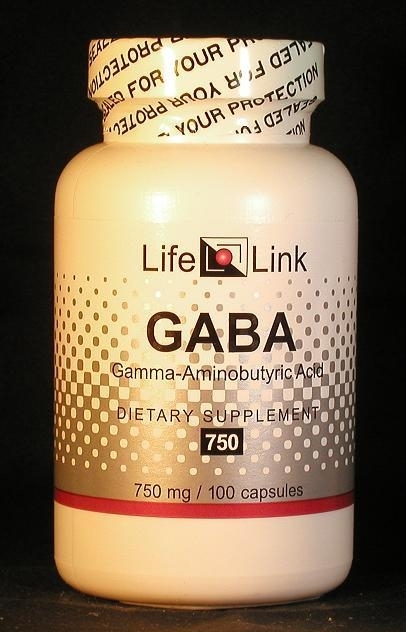 Gamma-aminobutyric acid (GABA) is an amino acid plays an important role in regulating the activity of nerve cells. It is the chief inhibitory neurotransmitter in the central nervous system and in the retina, and can also be excitatory under some circumstances. As a supplement, GABA has received less attention from medical researchers than it deserves. Some usages of GABA are supported by clinical studies, but many interesting and valid applications have never been investigated scientifically. alleviating some types of depression. GABA is closely related to another biomolecule called GHB (gamma-hydroxybutyrate); GABA and GHB are interconvertible in the brain. GHB was a very useful and inexpensive supplement for promoting relaxation and sleep until it was foolishly banned in the U.S. and other countries as part of the fiasco known as the ‘War-On-Drugs’. GHB, unlike GABA, readily crosses the blood-brain barrier; once in the brain, GHB is converted into GABA which then calms over-excited nerves. Since GABA crosses the blood-brain barrier less easily than GHB, larger doses are required to achieve the same goals. The Wikipedia offers a good overview of GABA and its actions in the body.2 A less technical review from IronMagazine3 is also useful despite its uncritical acceptance of government-spawned propaganda about GHB. Accordingly, we will limit our discussion of GABA to a brief summary of relevant research, and let you draw your own conclusions about what medical conditions it may be effective in treating. As a supplement, GABA has received less attention from medical researchers than it deserves. The handful of scientifically conducted clinical trials that have been conducted since 1980 have reported positive results with certain usages of GABA, but many interesting applications have never been investigated scientifically. Let us briefly look at the evidence for several of the above applications of GABA. Growth hormone levels have a positive impact on mood, energy, tissue repair, and muscle growth. Declines in the body’s production of growth hormone are associated with declines in the body’s health, youth, and vigor. Conversely, increases in growth hormone production can often improve the one’s mental and physical condition. A clinical trial in 1980 showed that a single 5-gram oral dose of GABA caused a five-fold increase in blood levels of growth hormone. Increasing the dose to 18 g/day for several days, however, resulted in a smaller effect.411 According to a 1994 study, a similar situation occurs in sheep given intravenous injections of GABA: a 10-mg dose produces a significant rise in growth hormone levels, but a 100-mg dose actually inhibits the release of growth hormone. Anecdotal reports give the impression that for some people GABA works well to reduce anxiety, while for others it does not. The only way to find out if it will work for you is to try it. Are GABA supplements useful for the conditions and purposes mentioned above? We aren’t allowed to tell you, so you should take a look at some of the references cited here, and then decide for yourself. 5-HTP is the immediate precursor of serotonin. Low levels of serotonin are associated with depression, obesity and sleep disorders. For best results avoid taking Vitamin B6 two (2) hours before or after taking 5-HTP.